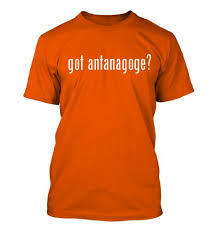 Antanagoge is a rhetorical device that means: putting a positive point on something negative. (2) answering the charge of an adversary, by a counter charge. Example: She always forgets my birthday, but she gives me gifts during the year. He lost his job, but he’s looking forward to spending more time with his family. Previous Previous post: What Did You Do Today?